NOTE: The CDC has identified Honduras as an affected area of the Zika outbreak. Pregnant women are advised to be cautious as the virus can lead to birth defects. Adults affected by the virus experience fever, rash, joint pain, and conjunctivitis (red eyes) typically lasting a week. You can learn more by visiting the official CDC website. 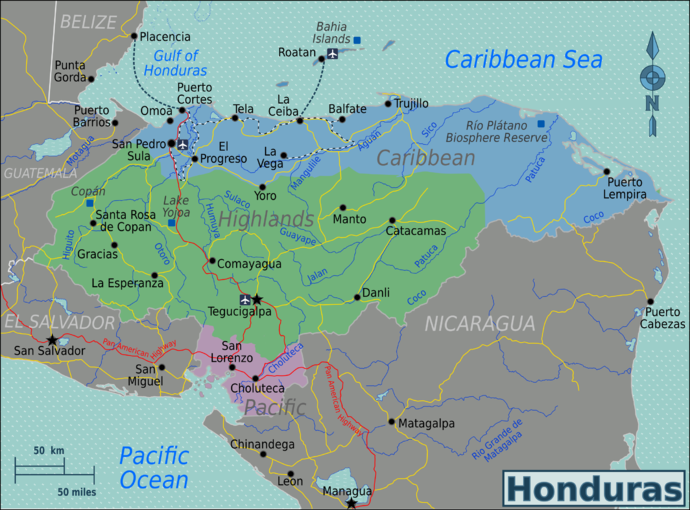 Honduras is the second biggest and second most populous country in Central America. It has colonial villages (Gracias, Comayagua), ancient Maya ruins (Copan), natural parks (Moskitia), and a Pacific and Caribbean coastline and the Bay Islands, with great beaches and coral reefs where snorkelling and diving are exceptional by any standard. The country is bordered by Guatemala to the northwest, El Salvador to the south and Nicaragua to the southeast and has one of the worlds highest murder rates due mostly to rampant gangs. Good amenities can be found in cities like Tegucigalpa, San Pedro Sula, La Ceiba, Tela, Utila, Roatán and at Copan, but elsewhere conditions can be quite basic, especially in the rural areas. You can find good hotels even in small towns if you are willing to pay a bit more (Honduras is not really an expensive country). Nevertheless a visit is worthwhile, especially to the ancient Maya ruins in Copán, the colonial towns of Gracias and Comayagua, and the fantastic Caribbean Coast. During the first millennium, Honduras was inhabited by the Maya civilization in the western part and other Pre-Columbian Mesoamerican cultures in the rest. Columbus first explored the country in 1502, and Honduras became a Spanish colony. Honduras, with four other Central American nations, declared its independence from Spain on September 15, 1821 to form a federation of Central American states. In 1838, Honduras left the federation and became independent. Political unrest rocked Honduras in the early 1900s, resulting in an occupation by U.S. Marines. Dictator Gen. Tiburcio Carias Andino established a strong government in 1932. In 1969, El Salvador invaded Honduras after Honduran landowners deported several thousand Salvadorans. Five thousand people ultimately died in what is called “the football war” because it broke out during a soccer game between the two countries. By threatening economic sanctions and military intervention, the Organization of American States (OAS) induced El Salvador to withdraw. After two and one-half decades of mostly military rule, a freely elected civilian government came to power in 1982. During the 1980s, Honduras was a haven for the anti-Communist contras fighting the Sandinista government of Nicaragua and an ally to Salvadoran government forces fighting against leftist guerrillas. The country was devastated by Hurricane Mitch in 1998, which killed about 5,600 people and caused almost $1 billion in damage, affecting seriously the development of the country and its vital infrastructure. Honduras is hot and humid almost year-round. Temperatures vary by altitude rather than season. The average high temperature nationwide is 32°C (90°F) and the average low is 20°C (68°F). Temperatures are coolest in mountain areas. The Caribbean coast can experience a lot of rain, the heaviest being from September to February. In Tegucigalpa, the capital, the climate remains more temperate and the dry season takes place from December to May. The capital can get chilly between December and January when the temperature in the city hovers around 23°C (73°F). the Caribbean coast with its beaches and port towns, offshore islands and a huge area of lowland jungle, including the UNESCO world-heritage site Río Plátano Biosphere Reserve. Tegucigalpa (Spanish pronunciation: [teɣusiˈɣalpa]) — the capital and largest city of Honduras with an international airport. San Pedro Sula — located in the Sula Valley in the northwest corner of the country, this is a major transportation and economic hub. Sugar cane and banana plantations spread all around the city. Most air passengers arrive to Honduras via San Pedro Sula (SAP) airport. Many hotels and restaurants to choose from. The city has the best nightlife in the country. Beaches in Omoa and Tela are 1 hour away. La Ceiba — port city on the Caribbean coast with great beaches and daily ferries to the Bay Islands. Surrounded by national parks, La Ceiba is for adventure travelers and eco-tourists. Hiking, boating, kayaking, and rafting are available very close by. Great lodging options in the Rio Cangrejal area and the Pico Bonito area near El Pino. El Progreso — located at a strategic crossroads where major highways towards Comayagua, San Pedro Sula and Tela all converge. Comayagua — the former capital of the country is today a quiet colonial town with a beautiful cathedral, notable Spanish architecture and an historic town centre. 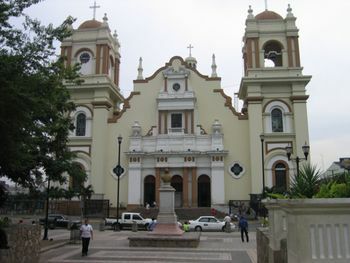 The Cathedral in Comayagua houses the oldest working clock in the American continent. You can arrange a local tour guide to see it for yourself. Gracias — a pleasant colonial mountain town; nearby Celaque National Park is home to the highest mountain in Honduras set amongst wonderful cloud forests, also nearby is Central America's highest canopy zipline in La Campa! After a day of hiking or zip-lining, relax in one of the thermal hot springs a few kilometers outside town. Puerto Cortes — the main harbour town on the Caribbean coast, it has the busiest port in Central America. Beautiful sunsets can be seen from the Municipal Beach with many restaurants, bars, and plenty of public parking. Omoa - very small, laid back, and relaxing barefoot beach town with the best water on the mainland, with a stunning view of a mountain range from the beach. Located 15 minutes past Puerto Cortes, on a small highway with views of the ocean along the way. Here you will find the San Fernando de Omoa fort, a relic from the Colonial period filled with history and cannons. Tela — an old city with a beautiful sandy coastline and is also home to Lancetilla, the second largest humid tropical botanical garden for commercial plants in the world. Santa Rosa de Copán — temperate mountain city in the western part of the region, and the nearest place of any size to Copán. Santa Rosa de Copan has had a coffee renaissance and you will find many great local independent coffee shops as well as a cigar factory. La Esperanza -- Smaller city in the Southern region of Honduras. About four hours drive from Tegucigalpa, La Esperanza is a good stopover on the way to Western Honduras. This is the stronghold of the Lencas, a native group from Honduras. Very colorful Sunday market with woven goods and pottery. Marcala -- a town in the Department of La Paz, is a quiet town that is very famous for the quality of the coffee grown in the hillsides surrounding the town. This is a great example of life in a rural Honduran town. Cusuco National Park — One of Honduras most exotic destinations, Leaving from San Pedro Sula by a 4x4 trail into the dense cloud forest. Bay Islands — Utila, Roatán, Guanaja, and the Hog Islands are a natural Caribbean paradise very popular for snorkelling and diving. Copán — one of the most impressive enclaves of the Maya civilization, Copan Ruinas is known for the quality of its sculptures. The Copan valley has several Mayan sites open to the public including: the main acropolis with the hieroglyphic staircase and the Rosalila Temple, Las Sepulturas, and El Rastrojon. All are worth a visit. Plan for at least a 2-3 day stay in Copan Ruinas. Some of the best pieces of Mayan sculpture have been moved to the local museums to protect them from the elements. The Museum of Mayan Sculpture next to the main acropolis, and the Regional Museum in the town's main plaza are must-sees. Lake Yojoa — the biggest lake in Honduras is famous for the numerous road-side restaurants selling fried fish. The tasty fish, and view of the lake are worth the visit. Nearby are two national parks (Cerro Azul Meambar, and Santa Barbara) that hold pristine rainforest and cloud forest as well as Honduras's first microbrewery. This is one of the best areas in the country for birdwatching. Río Plátano Biosphere Reserve — the largest tropical rainforest in Central America. When refering to Copan Ruinas many people call it just "Copan" But that is incorrect. "Copan" is actually the name of the departamento (like a state). If you want to refer to Copan Ruinas then you need to use the full name, "Copan Ruinas" which translates to "The ruins of Copan". Citzens of the EU, Japan, Norway, Malaysia, Singapore, Switzerland,India and most western countries do not need a visa. If you do need a visa, contact a Honduran consulate. Do note that there is a USD3 fee for all citizens of non Central American countries upon entry via land. Honduras has three major international airports with daily flights to Atlanta, Miami, Fort Lauderdale, New York and Houston are in San Pedro Sula airport code SAP, Tegucigalpa (Toncontin) airport code TGU and Roatan airport code RTB. The main international airlines serving the region are Avianca, Copa Air, Delta Air Lines, United Airlines, Spirit, and American Airlines. Iberia, Spain operates daily flights from Madrid to San Pedro Sula via Guatemala City (connecting with TACA). Maya Island Air also has a direct flight from Belize to San Pedro Sula (phone number 011-501-223-1140 or [email protected]). For domestic flights check Isleña, Atlantic and Aerolinas Sosa. Note that the interior domestic airlines frequently have flight cancellations, do not guarantee service, and are under no obligation to issue refunds if a flight does not occur. However, American carriers and their international code share partners listed above guarantee travel per U.S. industry standards. Hence, it is advisable not to rely on a domestic carrier to connect to an outbound international flight without having an alternative means to get to the departure point of the foreign bound aircraft in a timely fashion. For instance, if a flight cancellation occurs in La Ceiba headed to San Pedro Sula due to insufficient ticket sales (a common occurrence), a taxi can be hired for a $50-$100 spot price to run the distance in under two and a half hours. Note that if flying out of San Pedro Sula you will be charged a hefty 37.50$ (34$ if you are from Honduras) airport tax. From mid February 2015 onwards this exit tax will be included in the price of the air ticket. Possible from Guatemala, El Salvador, or Nicaragua. Cars are a good selection, but you must always be careful since the roads are not as well developed but good enough to have a pleasant ride. Traffic enforcement outside of stops to curtail the drug trade is minimal to non-existent, and drivers should be cautious of speeding vehicles as well as aggressive driving tactics (e.g. passing on uphill, curved terrain). Due to the confusing layout of border controls, it's easy to enter or leave Honduras without obtaining the appropriate stamp in your passport. Be aware that you may then be arrested and/or be given a heavy fine for having crossed the border illegally. Hedman Alas,  have their own secure terminal at the rear of the main bus station with waiting room, smoking lounge and cafeteria. First Class buses to and from Guatemala City, Copan, Tegucigalpa, Tela, La Ceiba and the San Pedro Sula airport. El Rey Express, Telephone: 550 8355. Direct Buses to and from Tegucigalpa, hourly. Catisa-Tupsa, Telephone: 552 1042. Direct Buses to and from Tela and La Ceiba, hourly. Toritos and Copanecos, Telephone: 553 4930. Direct Buses to and from Nueva Ocotepeque via Santa Rosa de Copan, 7 to 8 buses daily. Citul, Telephone: 553 0070. Buses to and from Puerto Cortes, hourly. Tica Bus, Telephone: 556-5149. Direct buses to and from Managua and El Salvador. Update June 2014: The location of Tica Bus Station in Tegus has MOVED. It's no longer in Comayagüela, but moved to the southern suburbs of Tegucigalpa, beyond the airport. A taxi cost around 120L. Taking the local bus is a great mode of transportation from and to cities within Honduras. Buses are affordable and efficient for you to travel along with the locals. Understand that the earlier you get on a bus, the more time you can spend in the city of your choice. Depending on how many stops the driver makes determines the length of travel time. If you need help knowing the exact fare or which stop is best to get off, ask the locals. Remember the bus is an everyday activity for them. Boats from Belize come in to the Caribbean ports like Puerto Cortes, but schedules are not regular and cannot be checked through the internet. Cruise ships commonly stop at the Bay Islands, however. Railways in Honduras have been built in the northern lowlands (Valle de Sula) since 1880s by two competing banana growers. They never extended to the capital Tegucigalpa or to the Pacific coast and never linked to other countries. San Pedro Sula - Puerto Cortes (50km, freight trains carrying mainly lumber) and occasional passenger trains around San Pedro Sula, for example during carneval and other holidays. Line between La Unión and Parque Nacional Cuero y Salado (9km, transport of coconuts to a processing plant and of tourists to national park). There are many rental car companies. Most have locations at San Pedro Sula and Tegucigalpa airports. Hertz, Budget, Avis, National, have local franchisees. Also independent car rental companies are available with competitive rates. There is regular ferry boat service from La Ceiba to the Bay Islands of Roatan and Utila. Service to Roatan is on the Galaxy Wave II. The ferry trip costs less than flying, and leaves (mostly) on time. A round-trip prima class ticket costs $53; round-trip general class, $43. Both First Class and general seating areas are comfortable and offer air conditioning and flat-screen TVs for your entertainment. The crossing takes about 80 minutes each way. Service to Utila is on the Utila Dream. Tickets cost about $25 each way and the crossing takes about 60 minutes. Both ferries leave from the same dock. You should arrive at the dock in La Ceiba about an hour early to buy tickets and check luggage. **If travelling to the bay islands during Semana Santa (Easter week) it is highly recommended to fly, as the wait for a ferry can be up to 8 hours. If you are a Senior citizen you will find the rate very attractive. If you are prone to sea sickness, the trip North to Roatan can be very uncomfortable, as the Galaxy is fighting the currents. Windy days, re-consider. 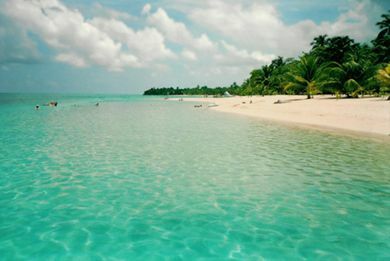 Otherwise it is a delightful trip, Utila to the West and the Cayos to the East. Last trip of the day to Roatan is awesome with a fanastic sunset. Galaxy II schedule: Roatan - La Ceiba 7AM. ; La Ceiba - Roatan 10AM. Roatan - La Ceiba 1 PM, La Ceiba - Roatan 4PM. Utila Dream Ferry: Utila - La Ceiba 7:00AM, La Ceiba - Utila 9:00AM, Utila - La Ceiba 3:20PM, La Ceiba - Utila 4:40PM. Hitchhiking is common in rural areas, even for single women, when there is no proper bus connection. By asking around you will be pointed to the various departure points. Expect to pay the equivalent bus fare at the conclusion of your journey. Spanish is the primary language spoken. English is hardly spoken outside of the biggest towns or the Bay Islands where it is a native tongue. In some areas such as Utila, Spanish and English have hybridized to produce a pidgin tongue that can at times be indecipherable even to native speakers of both languages. Native languages (Lenca, Miskitu, Garifuna, among others) are spoken in various parts of the country, but a Spanish speaker should never be hard to find. Keep a tourist's eye out for "missionary speakers," that is, English or Spanish speaking Hondurans who retain the strong linguistic accents of the nations of their childhood teachers despite no personal links to such countries themselves (e.g. Irish-English overtones are prominent in Utila). Exhibit caution about commenting on linguistic skills to locals even positively, as those who do not speak mainstream Spanish suffer certain social stigmas (eg not “real” Hondurans, lower class, etcetera). The best known traditional dance in Honduras is punta, called banguity (new life) by the Garífunas. There are different stories about why punta is danced at wakes. Claudio Mejía, a Garífuna from La Punta, Colon explains, "If a man was a happy, popular kind of guy in life, then you want to give him a happy kind of wake." This coincides with African traditions, that when the body dies, the soul is in a kind of stupor and does not leave the body immediately. So friends and relatives party one last time with the deceased. Here, new life is understood as making the transition from being a person to becoming an ancestor. Another explanation is given by Fausto Miguel Alvarez, a teacher from Cristales, Trujillo. "People dance, because even though this one Garífuna has died, another thousand will be born." Here new life is understood to be the new life created in the wee hours of the morning after people go home. Garífunas, like the West Africans they descend from, believe in reincarnation. The spirit of the now deceased grandfather, for example, can be reborn in one of the new grandchildren. The story behind the name punta is different from its Garífuna counterpart. Once when an enemy died, the people said, "We are going to celebrate and dance from punta a punta (point to point). The punta here refers to point - a piece of land that juts out into the sea. One Garífuna teacher said, "This is why some Garífunas do not agree with the dancing of punta at wakes. It is as if you were dancing when an enemy died." Punta Music and Rhythm Punta was originally danced just by older people. It is the only type of music played at Garífuna wakes. Punta can be sung at the end of mourning ceremonies, known as fin de novenario in Spanish. During a Garífuna wake, there are a number of activities going on. From time to time, family members wail and cry before a coffin that has been put in a specially decorated room. Then, some of the men tune up the drums to play punta. The women sing. People go in one by one or in pairs to dance. Punta music for wakes is played with traditional instruments. These include first and second drums, maracas, a conch shell and sometimes claves - two hardwood sticks that are beat together. The music is sung in Garífuna with a soloist and chorus, like African music or a Gospel music choir. Punta music sounds happy, but the words are often sad. "Yesterday you were well. Last night you caught a fever. Now in the morning you are dead," says one song. The rhythm pattern is very complex. One drum plays 2/4 or 4/4 beat. The second drum plays 6/8. This is the beat to which the feet move. The women sing in 4/4 time. Sometimes the songs have counter rhythms. The second drum is steady, but the conch shell, maracas, and first drum improvise solos similar to jazz. This type of sensual dance performed at wakes has also been reported in Jamaica and West Africa. Music also accompanies the dead to the tomb, a custom probably related to Yoruba burial customs, the same origin as the New Orleans jazz funeral. Cusuco National Park expeditions  Cusuco Park can be visited by private all inclusive tours leaving from San Pedro or following the Cusuco backpacking mountain route. Visited 10 weeks of the year by Operation Wallacea, one of the world's top end scientific expedition. Available activities range for all group styles either looking for adventure or just a relaxing mountain experience. Jungle waterfalls, night trekking, dwarf forest and many more. Punta Sal National Park, is a stunning ecosystem with beaches, mangroves and rain forest. Jaguars, and howler monkeys call this place home. You can arrange a boat trip from Tela. Celaque National Park: located in western Honduras near the town of Gracias, Lempira. A cloud forest with many hiking trails. It also has the highest mountain peak in Honduras at 2,849 meters above sea level. The Bay Islands: Utila, Roatán, and Guanaja. Here you will find the Earth’s second-largest coral reef ready for you to explore. If you wish to become a certified diver, great diving schools are well known in Utila and Roatán. Also, Utila provides hiking, kayaking, and a glorious beach for eco-friendly and nature-intrigued tourist. Or you may prefer an invigorating scuba dive in Roatán. Where you will have the chance to swim in the clear waters near the reef’s gigantic barrel sponges. Utila is a great place for spotting Whale Sharks in their migratory routes along the Gulf of Honduras. The Mosquito Coast, a large tract of rainforest located in the northeast region, is for the adventurous traveller to explore the natural wonders of the plains and wildlife of the tropics. Three different ethnic groups call La Moskitia home the Miskitos, the Pech and the Tahwakas. Please respect their culture and their traditional lifestyles. This is a great area for bird watching, or a multi-day rafting adventure. Copan Ruinas: Western Honduras is home to the ruins at Copan (a UNESCO World Heritage Site) which is believed to have been inhabited by the Mayans from 1200 BC. There are also 3 lively museums and other natural sites for the eco-tourists. Volunteer Honduras  ($725/week) 8-day, all-inclusive service trips in Honduras. 5 days of volunteering and 3 days of traveling to places like Copán Ruinas, La Ceiba, etc. Leather goods are particularly famous from here, though in truth you can find just about anything, from clothes to trinkets to food and drinks. The Mercado forcibly calls for you to use your bartering skills; obtaining the price you want can prove one of the more difficult—and therefore rewarding—activities in San Pedro Sula. The National currency of Honduras is the Lempira but, like almost everywhere in Central America, the U.S. Dollar acts as a second currency and nearly every business accepts both. The U.S. Dollar is the main currency on the Bay Islands due to the frequency of cruises that come by (and by looking around, there are a lot of Americans). It is wise to carry small bills (under $20), especially $2 bills (considered lucky and makes a good tip). It is very important to use only bills printed recently and to avoid notes with tears. ATM's can be found in most cities. Some ATM's dispense both U.S. Dollars and Lempiras and nearly all can be used in English. Be sure to bring cash to the Bay Islands because they do not have very many ATMs. Nearly all banks exchange money just make sure to bring your passport for identification purposes. As of March 2016, there are 22.60 Lempiras to one Dollar and 25.30L for €1. Sometimes it may be cheaper to buy in Lempiras. If going to another country, exchange all lempiras as they are useless once you leave the country, but they can be exchanged at most borders. If you have an internet capable mobile phone such as iPhone, Google Android, Nokia N95 etc or USB dongle for your laptop, you need a local SIM card (called a "chip" and costing roughly 50 lempiras) to start enjoying the prepaid access plans, which generally come in lots of an hour, a day, or a week and have a specific maximum usage. Under Honduras law only people resident in Honduras, i.e. with a Honduras identity, are able to purchase SIM cards. Here is a table for the settings and activation options for various providers, including approximate costs. Handicrafts - Honduras is famous for its Lenca ceramics and cotton sock manufacturing. If visiting San Pedro Sula, be sure to visit El Mercado Guamilito. You will find many wonderful and cheap handicrafts like hand carved wooden boxes, Lencan pottery, hammocks, paintings, leather products from Nicaragua, and beautiful hand-woven fabrics from Guatemala. Leather Items - Honduran leather items are of fine quality at only a fraction of the price they would be overseas, making your visit to Honduras a great time to purchase these. Bags, attaché cases, belts, wallets and even garments are a bargain. One of the producers in San Pedro Sula whose quality is up to par with international standards is Danilo's Pura Piel. Honduras has a long history as a silver mining country. Excellent artisans work the silver and produce very artistic and high quality silver products and jewellery. There are several different jewellers in town. Another popular item are paintings by Honduran artists. These usually depict colonial towns and mountain landscapes that are typical of Honduras. The best selection of these can be found at the Maymo art Gallery. Valle de Angeles, a town near Tegucigalpa, is also known for its beautiful handicrafts, such as carved boxes and tables, hammocks, etc. There are various "Platos tipico" in Honduras, that eaten for breakfast, lunch or dinner. The breakfast and dinner Plato Tipico usually includes: eggs (fried or scrambled), re-fried red beans, fresh cheese, cream, wheat flour tortillas, cream, avocado and fried green bananas (tajadas, literally slices). The variant for lunch usually includes rice, a meat (usually fried chicken or grilled pork or beef) and corn tortillas. A fresh salsa called "Chismol" is also part of the typical dish, a fresh, non-spicy salsa made of tomatoes, green peppers, onions, cilantro and lime juice. Red Chile sauce is also popular and always available. Baleadas are a Honduran original. A baleada sencilla (simple) consists of a wheat flour tortilla filled with refried red beans, cheese (queso), and a type of cream similar to sour cream but not sour (crema or mantequilla). For a "Baleada Especial" they can add extras, the most popular are: scrambled egg, avocado, fried pork, or shredded chicken. Other choices are fried corn tortilla tacos called "Tacos Flautas" and enchiladas. The tacos are meat rolled in a corn tortilla and deep fried. The enchiladas are a flat fried corn tortilla topped with ground beef, cheese and a red sauce. Food choices will vary depending on the location. Popular dishes according to region are: North Coast: seafood soup in coconut broth, fish soup with Machuca (a Garifuna style plantain mash), and whole fried fish with rice & beans, green plantain chips and a pickled onion salad. Western Honduras, especially Copan a hearthy chicken soup. Santa Rosa de Copan is famous for its wood oven roast pork. San Pedro Sula has some of the country's best nightlife and is a great place to go out and to drink and dance the night away or to catch up on all the latest movies. National beers: Salva Vida, Port Royal, Imperial and the newest Barena. To add, Barena is said to be the Miller Lite of Central America. Coffee is great, and the brands from Copan, La Paz and Santa Barbara are usually the best. Welchez is considered to be the best by many locals. Coffee from Lepaera, Lempira, was judged to be the best coffee in the world but can be difficult to find, even in Lepaera itself, where most brands found in stores are from Copan. There has been a resurgence in Honduran coffee culture with great emphasis on quality. You can now find coffee shops serving really good coffee in many cities and even small towns. Santa Rosa de Copan has at least 15 coffee shops. Taste Central American rum Flor de Caña (from Nicaragua) or Zacapa (from Guatemala). Timoshenko is a Honduran liquor from Santa Rosa worth a try. In La Ceiba or Tela you can find Guifitti a traditional Garifuna spirit with many herbal notes and bitters. An interesting taste. Honduras has a privately owned, independent soft drink factory in Santa Rosa de Copan. They sell the Copan Dry soft drink in tiny, retro-style bottles, in many flavors. It is similar to Mexico's Jarrito. Depending where you plan to visit, you will find hotels that provide great services. WARNING: Due to rising crime rates, along with kidnappings and the Honduras ability to respond to crimes, the U.S. Federal Government encourages US travellers NOT to travel to Honduras because the Government issued a travel warning and others shown below. According to Human Rights Watch, rampant crime and impunity for human rights abuses remain the norm in Honduras. Despite a downward trend in recent years, the murder rate is among the highest in the world. Efforts to reform the institutions responsible for providing public security have made little progress. Use common sense at all times. Be careful of deserted areas and of going out at night, especially after 9p.m.. Foreigners are sometimes robbed on the streets of Tegucigalpa and San Pedro Sula at night by thieves who stake out areas in front of tourist hotels. When taking a taxi in Tegucigalpa make sure the windows are not tinted, and check for radio dispatched walkie talkies as people have been robbed at gun or knife point. Dangerous areas are isolated from tourist destinations. Crime does still impact tourist areas in the large cities. Use caution when traveling alone in Honduras, at night its best to take a radio dispatched taxi no matter what part you're in. Malaria occurs in rural areas, Roatán and other Bay Islands. Remember Honduran food can be spicy too, so be careful if you are not used to that or ask to make sure it is not spiced. Many travel agencies and different places will tell you that Honduras is a dangerous country concerning illnesses, this is not true. People are just as ill all over Latin America (nothing out of what is normal), just take the necessary precautions. HIV is a problem in Honduras so be careful as you would in your own country. If hiking or spending significant time in the great outdoors, be prepared for a wide range of natural threats and nuisances including snakes, spiders, scorpions, and mosquitoes. On the upside, however, you can actually pick fruit off the trees. Despite violence and widespread poverty, Hondurans are friendly people who appreciate a respectful manner, and are usually very proud to have visitors in their community. It is important to greet and even introduce yourself if you are asking a question to a stranger. The basic greeting is to say "Hola", while waving your hand. The follow up is "como esta?" meaning How are you? Of course, like any other country, if you do need to ask a question from a stranger be careful but most of the time Hondurans will be friendly and more than happy to help you. Electricity is 110V, 60Hz, as in the United States and Canada. However, three-prong grounded plugs are not as common, and may be scarce in less upmarket hotels so two-prong adapters come in handy. Power cuts are common throughout Honduras, including regular pre-planned power cuts that last all day. This article contains content from Wikipedia's Rail transport in Central America article. View that page's transport in Central America}}&action=history revision history for the list of authors.